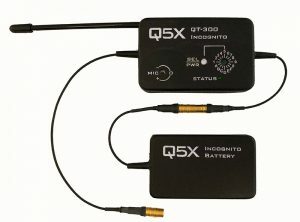 Micro sized transmitter in a flexible polymer splash-proof case. With an internal lithium ion rechargeable battery and Lemo connector for a removable lavalier. RF output power is user adjustable from 10 to 250mW. At 0.4″ thick, 4″ in length and weighing only 2 ounces (including lavalier microphone) it can be comfortably worn or hidden almost anywhere. It’s the most comfortable audio transmitter in the industry. It has an internal antenna and connector for detachable lavalier microphones. Wall power charger with barrel connector, manual, and Q5X one year warranty.